Hilti’s DD 200 Coring Rig is powerful, air-cooled drive unit with 3-Speed gearing and convenient controls to optimize drilling speed. Lighted power control indicators for easy operator training and maximum drilling performance. Quick release, motor mount for easy and fast assembly and 1-Person handling. 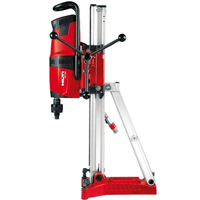 Sturdy, versatile drill stand tilts up to 45˚ and folds for easy transport and storage. Power control LED helps new users to achieve the optimum rate of drilling progress and maximum core bit life. Simple and quick: the new BL chuck system for keyless bit changing. A new drill stand: sturdy, versatile and very easy to set up and adjust. 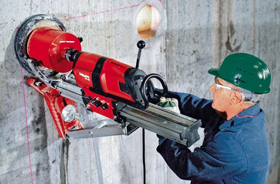 Diamond coring made easy to handle, easy to understand, and easy to operate.